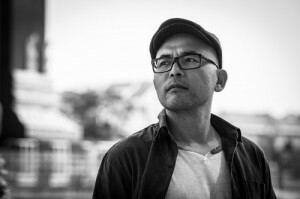 Masahiro Sugano is a Japanese award-winning filmmaker based in Phnom Penh, Cambodia where he runs an independent artist-run media lab together with his wife Anida Yoeu Ali that produces films, videos, installations and performance projects. “Cambodian Son“ is Sugano´s first documentary film about the deported spoken word artist Kosal Khiev and his inner battle while trying to find his footing amongst a new freedom. Khiev was born in a Thai refugee Camp as a nationless son of Cambodian parents fleeing from genocide and war. The family got asylum in California, where he got involved in a gang shootout, arrested at the age of 15 and sentenced to 16 years in prison, where he discovered Spoken Word Poetry. Although socialized he was deported to his unknown homeland he had never been before, as a result of the immigration policy in the USA and their repatriation agreement with Cambodia. I talked to Masahiro about the irony of freedom, his painful but also stunning experience during the filming process, and why art can change people. Chased: What does freedom mean to you and how would you define it? M. S.: Freedom is full of irony. Once you define it and go after it, you might get confined by the notion of it. Freedom to me is allowing yourself to go about without being bound by what others set for you, but one must be careful of the prison one creates for himself or herself. Kosal, the poet and the subject of my documentary film „Cambodian Son“, found his freedom in the most confined of all places: in the 1.8m x 3m prison cell during his 18 months solitary confinement. Chased: “Cambodian Son” is the story of deported spoken word artist Kosal Khiev and his inner battle while trying to find his footing amongst a new freedom … Looking back, what affected you most during the filming process? Does this experience influence your own artistry? M.S. : I was trying to just capture as much real moments as possible during the filming thus not much of events in the film affected me at the moment. During the climactic moment that unfolded in front of my eyes in France, my local camera assistant was balling, and I was extremely pissed at her thinking “These moments are not for you. It’s for the audience!!”. She was not able to follow my direction so I couldn’t use much of her footage. What has affected me through making this film is happening right now, and it only started after the film was done. Through the tour and release of this film, I met so many amazing people and have been invited to cities and towns in three different continents. This film seems to attract real people with big heart and great competence. Meeting them and getting to know these amazing souls has affected me and allowed to grow as a human being. Chased: What does Spoken Word Poetry mean to you and what kind of relationship do you have with Kosal? Kosal and I are basically and fundamentally fellow artists. I respect him for his art and I know he respects mine as well. But our relationship got more nuanced as the time went by. We are friends. He’s kind of my brother. Growing up with two mean sisters, I always wanted to have a brother. But getting to know Kosal, I’m glad I never had one. Kosal considers my wife a big sister and mentor. Our kids call him Uncle Kosal. My wife and I came to know his mother and sisters and brothers quite well. When I go to California, I visit his family members. And they feed me like it’s Thanksgiving everyday. I feel at home there. So there you go. It’s an interesting relationship. I’m sure I violated every rule there is for a professional documentary filmmaker to have with his/her subject. But I am not a documentary person. I never will be one. I hate making documentary films. 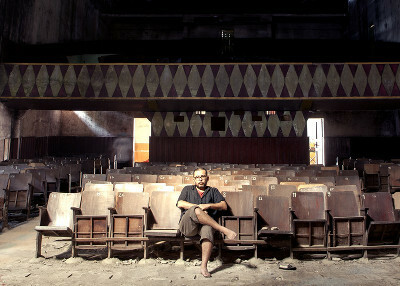 Chased: “Cambodian Son” has been screened at Film Festivals around the world. How did the people respond to your documentary? M. S.: I am glad you have that impression but in reality this film has had doors shut in front of its eyes 98% of the time. We usually have very dedicated and passionate supporters everywhere we go, but the top gate keepers of the big festivals and distribution companies have had no room for this film. It has been a great mystery for me given the reaction I have witnessed after each screening. In short a large number of people loved the film and have become active supporters to screen films in more locations and for more decision makers. But those gate keepers have not been very keen on it. And unlike what I expected, the most supportive group turned out to be not the youths, but rather people of more middle age and above. It may take a real life experience of failure and growth to appreciate a film like this. Chased: Your main work is animation- and fiction movies, especially short films. Why a documentary now? M. S.: It is what I was anointed to do by the power of the higher being. And I am not religious. But that’s the closest way I can put it. I was about to do a creative documentary that recounts Kosal’s life in youth. That was when London sent us an e-mail inviting Kosal to participate in Cultural Olympiad 2012. This happened less than a year after he was deported from the US. Everyone around me insisted I must make it into a documentary, a real documentary where, as you film, you don’t know which way the story will go. I know documentary filmmaking. I’ve seen it. They often film 3-4 years and spend another 3-4 years editing. Documentary filmmaking is for crazy people. That’s what I thought and I am more convinced now that I have finished one. And I am not crazy. But like I said, situations unfolded from 2011 to 2012 in such a way that I just had to make this feature length documentary. I hated it every step of the way. Chased: In your statement you describe the work on “Cambodian Son” as a very painful and exhausting experience. Is pain an important factor for a director to produce an authentical documentary? M. S.: I am not masochist. I prefer pleasure. But any large undertaking we do in life usually invites situations that are painful and exhausting and depressing and demoralizing, before it pays off. So early on, I had to decide that I was gonna do it not for money, which was obvious, not for my career, as you know I am not doing documentary, and not for Kosal, who is a rather unpredictable man due to his temperament at least for the first 4 years after prison. So if this film was going to be completed at all, I had to dedicate it to the bigger picture, the bigger cause. No man could finish a cathedral for his wife. Even when you were ready to do so when you get married, 10 years down the road, you would be complaining every little thing you might have to do for her. So if you were to build a cathedral, you could do so only for something much bigger than you, me or anyone particular, such as God. I had that clearly in my mind and I retained that. That is what got me through this project. And in my case, it was not God. It was this fight against the monster called hate of “the other” that seemed to have gone out of control after 911 in many parts of the world, especially in the US. 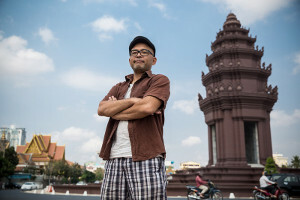 Chased: Kosal Khiev is working for prison poetry programs such as the Actors Gang Prison Project, founded by Actor Tim Robbins. Do you think art can change people? M. S.: Yes, I do. But it is not the art itself. The true change makers are the people who believe in the power of art and those who actually reach out for people who need it. Chased: Together with artist Anida Yoeu Ali you run STUDIO REVOLT - an independent artist run media lab that produces films, videos, installations and performance projects in Phnom Penh. Can you describe the Cambodian Art Scene and what it means to you and your work? M. S.: Cambodia has been a great blessing for both of us. It is a place of birth for my wife and collaborator, Anida Yoeu Ali. She left for the states at a very young age as a refugee. We came to Cambodia at the beginning of 2011 for her fellowship. We were based in Chicago prior. It was a little challenge at the beginning to find our footing but we were able to meet a large number of wonderful creative people and find great art opportunities which we could not have fathomed in the states. Often foreigners come to Cambodia wanting to save Cambodians from their misery. I laugh and applaud at them at the same time. I have done nothing to help Cambodians in the last four years but Cambodian people have been very generous, welcoming and helpful to what we have chosen to do here. I am heavily indebted to Cambodia and its people. I owe them. Chased: What is your next project? M. S.: I am trying to get back to fiction film making and I am currently working on a few ideas. One is a fantasy film my friend coined as “Killing Field” meets “Pan’s Labyrinth”. Another is coined as “Cambodian Rice Western”. Let’s see how they unfold. Chased: Is there anything else you would like to tell us? M. S.: I hope our film Cambodian Son will find large audience in Germany and across Europe in the near future. Issues of immigration and xenophobia are getting worse everywhere. I am sure this film can help people engage in a productive dialogue by reminding behind every person with a horrible label is a real human being wanting to make a meaningful life out of his or her own.